Since I gave birth to Little E, I have had a rather bad case of baby brain and quite honestly I have struggled to remember who is supposed to be where and on what day. You may remember the time I took Mister A to nursery on the wrong day - please don't judge me! 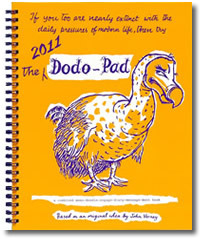 The Dodo Pad diary is Britain's best loved family organiser / planner - printed every year since 1966. Ideal for a family of up to five people (extra family members may, at your discretion, be marginalised). It's designed so that each person’s activities can be seen on a weekly to view basis with plenty of room on the opposite page for notes and the occasional (or regular) doodle. Lord Dodo warns you however that this style of family organiser is highly addictive; a few long-term users are known to have tried to kick the habit, only to return (much relieved) to this most desirable organizer after just a few fleeting months away. It may only be the 1st January but I can see that this little book is going to be my new best friend for 2011. I've already added all of our names and a couple of appointments and I've also had a bit of a doodle too - well it'd be rude not to! I've never seen a diary in this format before - my mum used to have a 'family calender' on her wall which was always good when we were growing up but it's not exactly handy is it? You can't carry that around with you! I know that this is advertised as a desk calender but I'll be keeping mine in Little E's changing bag so it's with me at all times and with my brain the way it is I can't really afford not to! And if that wasn't enough it's also full of fun facts, quotes and little poems to keep you smiling through the year. I think it's great. Thanks Lord Dodo! !